So here we are folks, one year later. The famous Pink Party thrown by my friends Erbil and Miriam,. is upon us again. Same place, new and old faces, lively music and lots of interesting food. Remember last year, the Turkish meatballs were the star of the show. You can see them here at this post on the 2011 Pink Party.. This year, the most intesting of eggplant based dishes stole the show for me. It turns out that in Turkey small eggplant are hollowed out , strung up and dried. Reminds me of what is done with Chili all across the Mediterranean and in New Mexico, the Chili capital of the US. These naturally preserved vegetables can then be brought back to life by soaking them in a warm bath. Then they are ready to be stuffed with your favorite ingredients, and then finally baked in an oven or cooked in covered pan. yogurt sauce would also make the perfect dip for these babies. All in all, the pot luck idea filled my friends table with many different dishes, and a few desserts too. 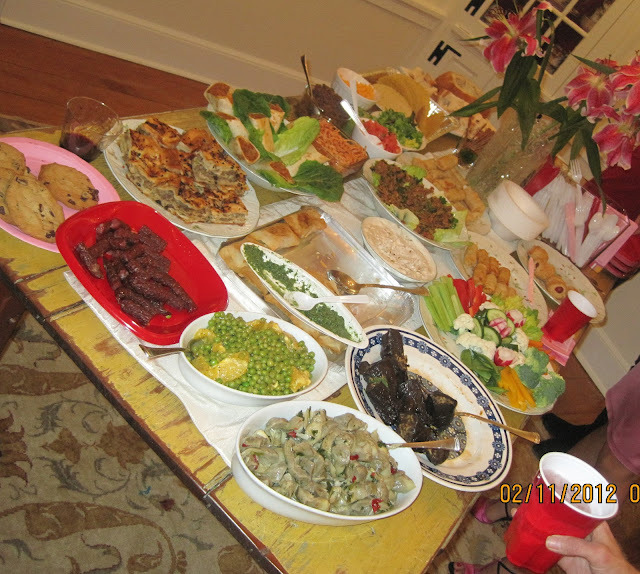 the party spread was abundant , and of high quality. My contributions tot he party were two dishes that I prepared in less than 20 minutes flat.I stuck with a vegetarian theme to be on the safe side. 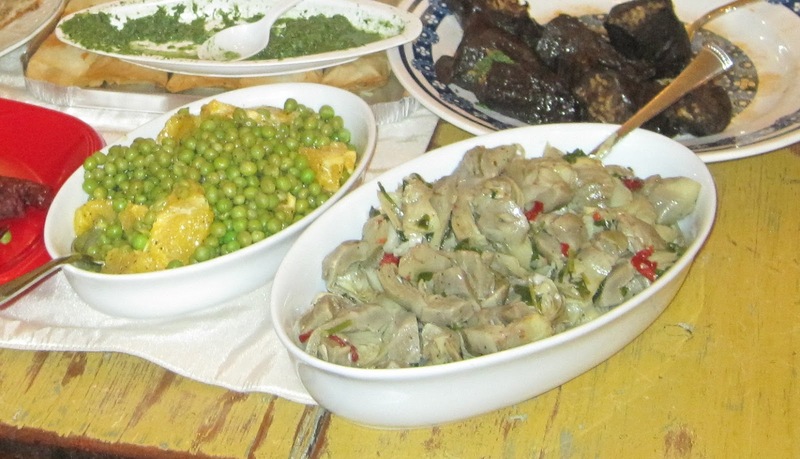 Some of the guests preferred dishes of a more healthy nature. The pea salad was inspired by dish made several years ago by hip chef Jamie Oliver . The artichokes were a variation on an old family recipe. Both easy to make. To make the salad, barely blanche some fresh or frozen sweet peas. Toss with a vinaigrette made with some lemon juice, a splash of orange juice, white wine vinegar. Add a few slices of sweet navel oranges. Season with S/P. This salad acts as a palate cleanser or can be used as part of an appetizer set.